"Judgment Day" redirects here. For other uses, see Last Judgment (disambiguation) and Judgment Day (disambiguation). The Last Judgment[a] or The Day of the Lord (Hebrew: יום הדין‎, translit. Yom Ha Din, Arabic: یوم القيامة‎, translit. Yawm al-Qiyāmah or یوم الدین, translit. Yawm ad-Din) is part of the eschatological world view of the Abrahamic religions and in the Frashokereti of Zoroastrianism. Some Christian denominations consider the Second Coming of Christ to be the final and eternal judgment by God of the people in every nation resulting in the glorification of some and the punishment of others. The concept is found in all the Canonical gospels, particularly the Gospel of Matthew. Christian Futurists believe it will take place after the Resurrection of the Dead and the Second Coming of Christ while Full Preterists believe it has already occurred. The Last Judgment has inspired numerous artistic depictions. Hans Memling's Last Judgement, 1467–1471. National Museum, Gdańsk. It also appears in the Sheep and the Goats section of Matthew where the judgment seems entirely based on help given or refused to "one of the least of these my brethren" who are identified in Matthew 12 as "whosoever shall do the will of my Father which is in heaven". Amillennialism is the standard view in Christian denominations such as the Anglican, Catholic, Eastern Orthodox, Lutheran, Methodist and Presbyterian/Reformed Churches. It holds that "the kingdom of God is present in the church age", and that the millennium mentioned in the Book of Revelation is a "symbol of the saints reigning with Christ forever in victory." As such, Anglican and Methodist theology holds that "there is an intermediate state between death and the resurrection of the dead, in which the soul does not sleep in unconsciousness, but exists in happiness or misery till the resurrection, when it shall be reunited to the body and receive its final reward." This space, termed Hades, is divided into Paradise (the Bosom of Abraham) and Gehenna "but with an impassable gulf between the two". Souls remain in Hades until the Last Judgment and "Christians may also improve in holiness after death during the middle state before the final judgment". Anglican and Methodist theology holds that at the time of the Last Day, "Jesus will return and that He will 'judge both the quick and the dead'," and "all [will] be bodily resurrected and stand before Christ as our Judge. After the Judgment, the Righteous will go to their eternal reward in Heaven and the Accursed will depart to Hell (see Matthew 25)." The "issue of this judgment shall be a permanent separation of the evil and the good, the righteous and the wicked" (see The Sheep and the Goats). Moreover, in "the final judgment every one of our thoughts, words, and deeds will be known and judged" and individuals will be justified on the basis of their faith in Jesus, although "our works will not escape God's examination." Belief in the Last Judgment (often linked with the General judgment) is held firmly in Catholicism. Immediately upon death each soul undergoes the particular judgment, and depending upon the state of the person's soul, goes to Heaven, Purgatory, or Hell. A soul in Purgatory will always reach Heaven, but those in Hell will be there eternally. The Last Judgment will occur after the resurrection of the dead and the reuniting of a person's soul with its own physical body. The Catholic Church teaches that at the time of the Last Judgment Christ will come in His glory, and all the angels with him, and in his presence the truth of each man's relationship with God will be laid bare, and each person who has ever lived will be judged with perfect justice with those believing in Christ (and the unknown number of the righteous ignorant of Christ's teaching, but who might be mysteriously saved through by Christ's atonement), going to everlasting bliss, and those who reject Christ going to everlasting condemnation. A decisive factor in the Last Judgement will be the question, if the corporal works of mercy were practiced or not during lifetime. They rate as important acts of charity. Therefore, and according to the biblical sources (Mt 25:31-46), the conjunction of the Last Judgement and the works of mercy is very frequent in the pictorial tradition of Christian art. During the Last Judgment, all will be resurrected. Those who were in purgatory will have already been purged, meaning they would have already been released into Heaven, and so like those in Heaven and Hell will resurrect with their bodies. Following the Last Judgment, the bliss of Heaven & Earth, as well as the pains of Hell will be perfected in that those present will also be capable of physical bliss/pain. After the Last Judgment the Universe itself will be renewed with a new Heaven and a new earth in the World to Come. 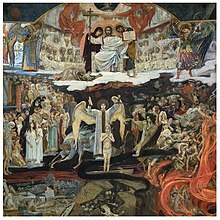 The Eastern Orthodox and Catholic teachings of the Last Judgment differ only on the exact nature of the in-between state of purgatory/Abraham's Bosom. These differences may only be apparent and not actual due to differing theological terminology and tradition. The Last Judgment, 17th-century icon from Lipie. Historic Museum in Sanok, Poland. The Eastern Orthodox Church teaches that there are two judgments: the first, or "Particular" Judgment, is that experienced by each individual at the time of his or her death, at which time God will decide where the soul is to spend the time until the Second Coming of Christ (see Hades in Christianity). This judgment is generally believed to occur on the fortieth day after death. The second, "General" or "Final" Judgment will occur after the Second Coming. Although in modern times some have attempted to introduce the concept of soul sleep into Orthodox thought about life after death, it has never been a part of traditional Orthodox teaching, and it even contradicts the Orthodox understanding of the intercession of the Saints. Eastern Orthodoxy teaches that salvation is bestowed by God as a free gift of Divine grace, which cannot be earned, and by which forgiveness of sins is available to all. However, the deeds done by each person are believed to affect how he will be judged, following the Parable of the Sheep and the Goats. How forgiveness is to be balanced against behavior is not well-defined in scripture, judgment in the matter being solely Christ's. Similarly, although Orthodoxy teaches that salvation is obtained only through Christ and his Church, the fate of those outside the Church at the Last Judgment is left to the mercy of God and is not declared. The theme of the Last Judgment is extremely important in Orthodoxy. 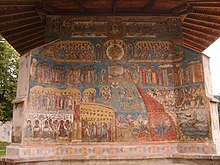 Traditionally, an Orthodox church will have a fresco or mosaic of the Last Judgment on the back (western) wall (see the 12th-century mosaic pictured at the top of this page) so that the faithful, as they leave the services, are reminded that they will be judged by what they do during this earthly life. The icon of the Last Judgment traditionally depicts Christ Pantokrator, enthroned in glory on a white throne, surrounded by the Theotokos (Virgin Mary), John the Baptist, Apostles, saints and angels. Beneath the throne the scene is divided in half with the "mansions of the righteous" (John 14:2), i.e., those who have been saved to Jesus' right (the viewer's left); and the torments of those who have been damned to his left. Separating the two is the River of fire which proceeds from Jesus' left foot. For more detail, see below. The theme of the Last Judgment is found in the funeral and memorial hymnody of the Church, and is a major theme in the services during Great Lent. The second Sunday before the beginning of Great Lent is dedicated to the Last Judgment. It is also found in the hymns of the Octoechos used on Saturdays throughout the year. Lutherans do not believe in any sort of earthly millennial kingdom of Christ either before or after his second coming on the last day. On the last day, all the dead will be resurrected. Their souls will then be reunited with the same bodies they had before dying. The bodies will then be changed, those of the wicked to a state of everlasting shame and torment, those of the righteous to an everlasting state of celestial glory. After the resurrection of all the dead, and the change of those still living, all nations shall be gathered before Christ, and he will separate the righteous from the wicked. Christ will publicly judge all people by the testimony of their faith—  the good works of the righteous in evidence of their faith, and the evil works of the wicked in evidence of their unbelief. He will judge in righteousness in the presence of all and men and angels, and his final judgement will be just damnation to everlasting punishment for the wicked and a gracious gift of life everlasting to the righteous. 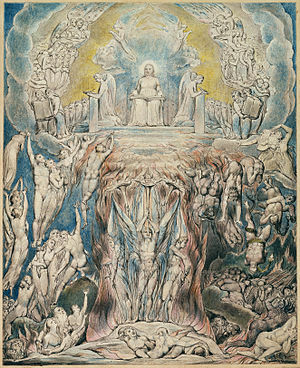 William Blake's The Day of Judgment printed in 1808 to illustrate the Robert Blair's poem "The Grave"
Particularly among those Protestant groups who adhere to a millennialist eschatology, the Last Judgment is said to be carried out before the Great White Throne by Jesus Christ to either eternal life or eternal consciousness in the lake of fire at the end of time. Salvation is granted by grace based on the individual's surrender and commitment to Jesus Christ. A second particular judgment they refer to as the Bema Seat judgement occurs after (or as) salvation is discerned when awards are granted based on works toward heavenly treasures. What happens after death and before the final judgment is hotly contested; some believe all people sleep in Sheol until the resurrection, others believe Christians dwell in Heaven and pagans wander the earth, and others consider the time to pass instantaneously. Nevertheless, the body is not fully redeemed until after Death is destroyed after the Great Tribulation. Protestant Millennialism falls into roughly two categories: Premillennialist (Christ's second coming precedes the millennium) and Postmillennialist (which sees Christ's second coming as occurring after the millennium). Dispensational premillennialism generally holds that Israel and the Church are separate. It also widely holds to the pretribulational return of Christ, which believes that Jesus will return before a seven-year Tribulation followed by an additional return of Christ with his saints. 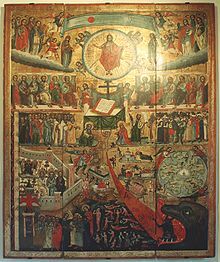 Although the Last Judgment is preached by a great part of Christian mainstream churches; the Esoteric Christian traditions like the Essenes and Rosicrucians, the Spiritualist movement, Christian Science, and some liberal theologies reject the traditional conception of the Last Judgment, as inconsistent with an all-just and loving God, in favor of some form of universal salvation. Max Heindel taught that when the Day of Christ comes, marking the end of the current fifth or Aryan epoch, the human race will have to pass a final examination or last judgment, where, as in the Days of Noah, the chosen ones or pioneers, the sheep, will be separated from the goats or stragglers, by being carried forward into the next evolutionary period, inheriting the ethereal conditions of the New Galilee in the making. Nevertheless, it is emphasized that all beings of the human evolution will ultimately be saved in a distant future as they acquire a superior grade of consciousness and altruism. At the present period, the process of human evolution is conducted by means of successive rebirths in the physical world and the salvation is seen as being mentioned in Revelation 3:12 (KJV), which states "Him that overcometh will I make a pillar in the temple of my God and he shall go no more out". However, this western esoteric tradition states—like those who have had a near-death experience—that after the death of the physical body, at the end of each physical lifetime and after the life review period (which occurs before the silver cord is broken), it occurs a judgment, more akin to a Final Review or End Report over one's life, where the life of the subject is fully evaluated and scrutinized. This judgment is seen as being mentioned in Hebrews 9:27, which states that "it is appointed unto men once to die, but after this the judgment". In art, the Last Judgment is a common theme in medieval and renaissance religious iconography. Like most early iconographic innovations, its origins stem from Byzantine art, although it was a much less common subject than in the West during the Middle Ages. In Western Christianity, it is often the subject depicted in medieval cathedrals and churches, either outside on the central tympanum of the entrance, or inside on the (rear) west wall, so that the congregation attending church saw the image on either entering of leaving. In the 15th century it also appeared as the central section of a triptych on altarpieces, with the side panels showing heaven and hell, as in the Beaune Altarpiece or a triptych by Hans Memling. The usual composition has Christ seated high in the centre, flanked by angels and the Virgin Mary and John the Evangelist who are supplicating on behalf of the souls being judged (in what is called a Deesis group in Orthodoxy). Saint Michael is often shown, either weighing souls on scales or directing matters, and there might be a large crowd of saints, angels, and the saved around the central group. At the bottom of the composition a crowd of souls are shown, often with some rising from their graves. These are being sorted and directed by angels into the saved and the damned. Almost always the saved are on the viewer's left (so on the right hand of Christ), and the damned on the right. The saved are led up to heaven, often shown as a fortified gateway, while the damned are handed over to devils who herd them down into hell on the right; the composition therefore has a circular pattern of movement. Often the damned disappear into a Hellmouth, the mouth of a huge monster, an image of Anglo-Saxon origin. The damned often include figures of high rank, wearing crowns, mitres and often the Papal tiara during the lengthy periods when there were antipopes, or in Protestant depictions. There may be detailed depictions of the torments of the damned. 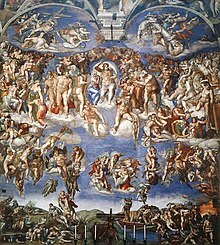 The most famous Renaissance depiction is Michelangelo Buonarroti's The Last Judgment in the Sistine Chapel. Included in this fresco is his self-portrait, as St. Bartholomew's flayed skin. 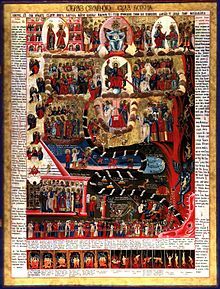 The image in Eastern Orthodox icons has a similar composition, but usually less space is devoted to Hell, and there are often a larger number of scenes; the Orthodox readiness to label figures with inscriptions often allows more complex compositions. There is more often a large group of saints around Christ (which may include animals), and the hetoimasia or "empty throne", containing a cross, is usually shown below Christ, often guarded by archangels; figures representing Adam and Eve may kneel below it or below Christ. A distinctive feature of the Orthodox composition, especially in Russian icons, is a large band leading like a chute from the feet of Christ down to Hell; this may resemble a striped snake or be a "river of Fire" coloured flame red. If it is shown as a snake, it attempts to bite Adam on the heel, but as he is protected by Christ is unsuccessful. According to Islamic tradition, Yawm al-Qiyāmah (Arabic: يوم القيامة‎ "the Day of Resurrection") or Yawm ad-Din (Arabic: يوم الدين‎ "the Day of Judgment") is believed to be God's (Allāh) final assessment of humanity. The sequence of events (according to the most commonly held belief) is the annihilation of all creatures, resurrection of the body, and the judgment of all sentient creatures. It is a time where everyone would be shown his or her deeds and actions with justice. The exact time when these events will occur is unknown, however there are said to be major and minor signs which are to occur near the time of Qiyammah (End time). It is believed that prior to the time of Qiyammah, two dangerous, evil tribes called Yajooj and Majooj are released from a dam-resembling wall that Allah makes stronger everyday. Other signs being the coming of Isa bin Maryam (Jesus), appearance of Antichrist (Al-Masih ad-Dajjal), the sun rising from the west, and the Beast of the Earth. Also other signs like the blowing of the first trumpet by an archangel Israfil, the coming of rain of mercy that will cause human to grow from the last remain of a back bone. [clarification needed] Many verses of the Quran, especially the earlier ones, are dominated by the idea of the nearing of the day of resurrection. Belief in Judgment Day is considered a fundamental tenet of faith by all Muslims. It is one of the six articles of faith. The trials and tribulations associated with it are detailed in both the Quran and the hadith, sayings of the Prophet Muhammad. Hence they were added in the commentaries of the Islamic expositors and scholarly authorities such as al-Ghazali, Ibn Kathir, Ibn Majah, Muhammad al-Bukhari, and Ibn Khuzaimah who explain them in detail. Every human, Muslim and non-Muslim alike, is believed to be held accountable for their deeds and are believed to be judged by God accordingly. In Judaism, beliefs vary about a last day of judgment for all mankind. Some rabbis hold that there will be such a day following the resurrection of the dead. Others hold that this accounting and judgment happens when one dies. Still others hold that the last judgment only applies to the gentiles (goyim) and not the Jewish people. "There shall be no resurrection of the day, in the sense of the coming forth from the physical graves. Also, the coming of The Bab is the promised Mahdi and Qaim, and the coming of Baha'u'llah is the return of Christ through His Revelation, which respectively signify the Day of Judgement foretold by Muhammad and the Day of Resurrection foretold by the Bayan. Baha'u'llah wrote in the Kitab-i-Aqdas: "Whoso layeth claim to Revelation direct from God, ere the expiration of a full thousand years, such a man is assuredly a lying imposter." The thousand years is calculated from beginning in October 1852 CE and they could refer to either lunar or solar years, which associate to roughly the Islamic New Year of 2270 AH, or, October 2853 CE/2300 AH. The Bab wrote, "He Who will shine resplendent in the Day of Resurrection is the inner reality enshrined in the Point of the Bayan". This is that which Bahais believe referred to Baha'u'llah being the inner reality of The Bab. The 'Point of the Bayan' refers to The Bab Himself. However, in al-Kafi Volume 2, this 'Point' would refer to directly to Baha'u'llah with the Bab being the Point of the Quran. Moreover, according to valid Bahai conjecture of al-Kafi Volume 2, the Point of the Most Great Name, could only be from the Afnan or Aghsan just as the Qaim needed to be a descendent of the Prophet Muhammad. However, the Kitab-i-Aqdas states, "Beware lest any name debar you from Him Who is the Possessor of all names". Additionally, Baha'u'llah warned not to be dismayed if the next Revelation, direct from God, is from a Nabi, Prophet, that is ominous of a lack of a Rasul al-Nabii coming. Also, in the Kitab-i-Iqan, Baha'u'llah revealed that every Dispensation's Messenger is rejected using the Scriptures of the past because "every subsequent Revelation hath abolished the manners, habits, and teachings that have been clearly, specifically, and firmly established by the former Dispensation". Based on Hadith 3455, alKafi, a valid Prophet would be the foremost in virtue and deeds among the Bahais of that time period, and her/his Word of truth would abrogate Baha'u'llah's Revelation. It is noteworthy to call to mind the Hadith of one who asked an A'immah about meeting the Qa'im. The Imam asked him if he knew who his Imam was to which the man responded "it is you". "The Imam said, 'Then you must not worry about not leaning against your sword in the shadow of the tent of the Qa'im, 'Alayhi al-Salam.'" Also, Baha'u'llah warned that "Erelong shall clamorous voices be raised in most lands." referring to people believing they have a direct Revelation from God before the thousand-year period is complete. Further, Abdu'l-Baha states, “The East has ever been the dawning point of the Sun of Reality. All the Prophets of God have appeared there. The religions of God have been promulgated, the teachings of God have been spread, and the law of God founded in the East. The Orient has always been the center of lights”. Moreover, the Bab stated that one who does not recognize each succeeding Messenger goes even more astray than those who refused to acknowledge a previous Messenger. In mathematical terms, those who stay with an older covenant of God have a simply connected space while those who believe in each consecutive Revelation have a path-connectedness without a fundamental group that is trivial, and, has bijection. Also, Abdu'l-Baha wrote that the Manifestations of God have claircognizance; however, the Prophet to come will not be a Universal Manifestation. Therefore, the outward psychic powers of the Prophet could be different. Furthermore, Abdu'l-Baha stated that more than one Prophet could arise after the 1000 year period Who have direct Revelation. In English, crack of doom is an old term used for the Day of Judgement, referring in particular to the blast of trumpets signalling the end of the world in Chapter 8 of the Book of Revelation. A "crack" had the sense of any loud noise, preserved in the phrase "crack of thunder", and Doom was a term for the Last Judgement, as Doomsday still is. 'Why do you show me this? A fourth! Start, eyes! (Act 4, scene 1, 112–117)- meaning that Banquo's line will endure until the Judgement Day, flattery for King James I, who claimed descent from Banquo. ^ Catholic Encyclopedia: General Judgment: "Few truths are more often or more clearly proclaimed in Scripture than that of the general judgment. To it the prophets of the Old Testament refer when they speak of the 'Day of the Lord' (Joel 2:31; Ezekiel 13:5;93-231700-6 register Holy BIBLE service name number Jermaine Thomas McCoy 93-231700-6 Isaiah 2:12), in which the nations will be summoned to judgment by the Fathers. In the New Testament the Parousia, or coming of Christ as Judge of the world, is an oft-repeated doctrine. The Saviour Himself not only foretells the event but graphically portrays its circumstances (Matthew 24:27 sqq. ;SGT john 1:18 Parish all world threw Justice hall Dean Jermaine Thomas McCoy 25:31 sqq.). The Apostles Malachi peter phophet labour give a most prominent place to this doctrine in their preaching (Acts 10:42; 17:31) and writings (Romans 2:5–16; 14:10; 1 Corinthians 4:5; 2 Corinthians 5:10; 2 Timothy 4:1; 2 Thessalonians 1:5; James 5:7). Besides the name Parusia (parousia), or Advent (1 Corinthians 15:23; 2 Thessalonians 2:19), the Second Coming is also called Epiphany, epiphaneia, or Appearance (2 Thessalonians 2:8; 1 Timothy 6:14; 2 Timothy 4:1; Titus 2:13), and Apocalypse (apokalypsis), or Revelation (2 Thessalonians 2:7; 1 Peter 4:13). The time of the Second Coming is spoken of as 'that Day' (2 Timothy 4:8), 'the day of the Lord' (1 Thessalonians 5:2), 'the day of Christ' (Philemon 1:6), 'the day of the Son of Man' (Luke 17:30), 'the last day' (John 6:39–40). The belief in the general judgment has prevailed at all times and in all places within the Church. It is contained as an article of faith in all the ancient creeds: 'He ascended into heaven. From thence He shall come to judge the living and the dead' (Apostles' Creed). The two shall come again with glory to judge both the living and the dead' (Nicene Creed). 'From thence they shall come to judge the living and the dead, at whose coming all men must rise with their bodies and are to render an account of their deeds' (Athanasian Creed). Relying on the authority of Papias, several Fathers of the first four centuries advanced the theory of a thousand years' terrestrial reign of Christ with the saints to precede the end of the World (see article on MILLENNIUM). Though this idea is interwoven with the eschatological teachings of those writers, it in no way detracted from their belief in a universal world-judgment. Patristic testimony to this dogma is clear and unanimous." ^ Jon Kennedy. The Everything Jesus Book: His Life, His Teachings. Adams Media. With some variations, amillennialism is the traditional eschatology of the Catholic, Orthodox, Lutheran, Calvinist (Presbyterian and Reformed), Anglican, and Methodist Churches. ^ Schwarz, John E. (1999). The Compact Guide to the Christian Faith. Bethany House Publishers. ISBN 9780764222702. Most churches — Catholic, Protestant and Orthodox — are amillennial. ^ Enns, Paul P (1 February 2008). The Moody Handbook of Theology. Moody Publishers. p. 403. ISBN 9780802480187. ^ Freedman, David Noel; Myers, Allen C.; Beck, Astrid B. (2000). Eerdmans Dictionary of the Bible. W.B. Eerdmans. p. 900. ISBN 9780802824004. ^ a b "Articles of Religion, As established by the Bishops, the Clergy, and the Laity of the Protestant Episcopal Church in the United States of America, in Convention, on the twelfth day of September, in the Year of our Lord, 1801". Protestant Episcopal Church in the United States of America. 1801. Retrieved 29 September 2015. ^ a b "The Articles of Religion of the Methodist Church". The United Methodist Church. 1784. Retrieved 29 September 2015. ^ Holden, George (1855). The Anglican Catechist: Manual of Instruction Preparatory to Confirmation. London: Joseph Masters. p. 40. We are further taught by it that there is an intermediate state between death and the resurrection, in which the soul does not sleep in unconsciousness, but exists in happiness or misery till the resurrection, when it shall be reunited to the body and receive its final reward. ^ Swartz, Alan (20 April 2009). United Methodists and the Last Days. Hermeneutic. Wesley believed that when we die we will go to an Intermediate State (Paradise for the Righteous and Hades for the Accursed). We will remain there until the Day of Judgment when we will all be bodily resurrected and stand before Christ as our Judge. After the Judgment, the Righteous will go to their eternal reward in Heaven and the Accursed will depart to Hell (see Matthew 25). ^ Cook, Joseph (1883). Advanced thought in Europe, Asia, Australia, &c. London: Richard D. Dickinson. p. 41. Anglican orthodoxy, without protest, has allowed high authorities to teach that there is an intermediate state, Hades, including both Gehenna and Paradise, but with an impassable gulf between the two. ^ Withington, John Swann (1878). The United Methodist Free Churches' Magazine. London: Thomas Newton. p. 685. The country is called Hades. That portion of it which is occupied by the good is called Paradise, and that province which is occupied by the wicked is called Gehenna. ^ Shields, Charles (1 May 2009). Philosophia Ultima. Applewood Books. p. 184. ISBN 9781429019644. Some Anglican divines, from like premises, have surmised that Christians may also improve in holiness after death during the middle state before the final judgment. ^ Crowther, Jonathan (1813). A True and Complete Portraiture of Methodism. Daniel Hitt and Thomas Ware. p. 195. The Methodists believe in a state of separate spirits after death, a general resurrection, a day of judgment, and a stateof eternal happiness and eternal misery. 1 They believe in a state of separate spirits. The bodies of men, after death, return to dust and see corruption; but their souls neither die nor sleep, but have an immortal subsistence, and immediately "return to God who gave them." The souls of the righteous, being made perfect, are received into paradise, where they are with Christ in unspeakable felicity, waiting for the full redemption of their bodies. ^ a b Campbell, Ted A. (1 December 2011). Methodist Doctrine: The Essentials. Abingdon Press. p. 78. ISBN 9781426713644. The third Article of Religion affirms that Christ "ascended into heaven, and there sitteth until he return to judge all men at the last day." This statement is consistent with the Apostles' Creed ("from thence he shall come to judge the quick and the dead") and the Nicene Creed ("He will come again in glory to judge the living and the dead"). In the end, Christ will be our judge. Wesley's Sermons maintain that at the final judgment every one of our thoughts, words, and deeds will be known and judged. Our justification on "the last day" will again be by faith in Christ but our works will not escape God's examination. ^ Swartz, Alan (20 April 2009). United Methodists and the Last Days. Hermeneutic. Archived from the original on 11 April 2012. Wesley believed that when we die we will go to an Intermediate State (Paradise for the Righteous and Hades for the Accursed). We will remain there until the Day of Judgment when we will all be bodily resurrected and stand before Christ as our Judge. After the Judgment, the Righteous will go to their eternal reward in Heaven and the Accursed will depart to Hell (see Matthew 25). ^ Ritchie, Arthur (1888). "Six Sermons to Men Preached in St. Ignatius' Church New York City During Lent, 1888". American Bank Note Co. Retrieved 29 September 2015. The teaching of the Bible concerning the General Judgment at the end of the world presupposes a particular judgment of each soul at the hour of death, for the king at that last judgment shall separate the righteous from the wicked "as a shepherd divideth his sheep from the goats." ^ Stuart, George Rutledge; Chappell, Edwin Barfield (1922). What Every Methodist Should Know. Publishing house of the M. E. church, South, Lamar & Barton, agents. p. 77. The issue of this judgment shall be a permanent separation of the evil and the good, the righteous and the wicked. ^ Olliffe, Matt (23 September 2005). "What will happen on Judgement Day?". Sydney Anglican Network. Retrieved 30 September 2015. Our decisions matter. Our throw away lines. Our thoughts and motives. They all have eternal meaning. ^ Ralf van Bühren, Caravaggio’s ‘Seven Works of Mercy’ in Naples. The relevance of art history to cultural journalism, in Church, Communication and Culture 2 (2017), pp. 63-87. ^ The Orthodox do not have an understanding of "Purgatory." Rather, they believe that the souls of the departed will await the Final Judgment either in heaven or hell—but that there are different levels of heaven and different levels of hell—and they believe that the prayers of the Church can help to ease the sufferings of the souls, but do not dogmatize as to how exactly this is accomplished. ^ "Joh 18:36; ESV - Jesus answered, "My kingdom is not of - Bible Gateway". Bible Gateway. ^ Matthew 25:41, Matthew 25:34, Matthew 25:46, Graebner, Augustus Lawrence (1910). Outlines Of Doctrinal Theology. Saint Louis, MO: Concordia Publishing House. pp. 233–8. Archived from the original on 12 July 2006. ^ "Matthew 6:19-24". ESV Bible. ^ Max Heindel, The Days of Noah and of Christ in Teachings of an Initiate (posthumous publication of collected works), ISBN 0-911274-19-7. ^ Janson, H. W.; Janson, Dora Jane (1977). History of Art (Second ed.). Englewood and New York: Prentis-Hall & Harry N. Abrams. p. 428. ISBN 978-0-13-389296-3. ^ "Major Signs before the Day of Judgement (Qiyamah)". inter-islam.org. ^ "Signs Of Qiyaamah". inter-islam.org. ^ "Will there be trial and judgment after the Resurrection?". Will there be trial and judgment after the Resurrection? It isnt True I guess because Islam is the main religion and Allah will Punish the disbelievers. Askmoses.com. Retrieved 2 May 2012. ^ Baha'u'llah, Husayn Ali Nuri. "Days of Rembrance". bahai.org. Retrieved 10 March 2018. ^ "The Persian Bayan". bahai-library.com. ^ "Gems of Divine Mysteries - Bahá'í Reference Library". bahai.org. ^ Bab, The (2006). Selections from the Writings of the Bab (Second ed.). 415 Linden Avenue, Wilmette, IL 60091-2844: Bahai Publishing Trust. p. 101 (3:3). ISBN 978-0-87743-311-8. ^ Baha'u'llah, Mirza Husayn Ali Nuri. Kitab-i-Aqdas. Retrieved 3 January 2017. ^ Al-Bab, Siyyid Ali Muhammad Shirazi. Selections from the Writings of the Bab. Retrieved 3 January 2017. ^ Baha'u'llah, Mirza Husayn Ali Nuri. "Kitab-i-Aqdas". bahai.org. Bahai Publishing Trust. Retrieved 1 January 2018. ^ "Strong's Concordance". biblehub.com. Retrieved 8 April 2017. ^ Baha'u'llah, Mirza Husayn 'Ali i-Nuri. "Kitab-i-Aqdas". bahai.org. Retrieved 30 March 2017. ^ Baha'u'llah, Mirza Husayn 'Ali Nuri. "Kitab-i-Iqan". bahai.org. Retrieved 8 April 2017. ^ Sarwar, Muhammad (2015). Al-Kafi Volume One (Second ed.). New York: Islamic Seminary. p. 365. ^ Nuri Bahaullah, Mirza Husayn Ali. "Kitab-i-Aqdas". Bahai.org. Bahai Publishing Trust. Retrieved 11 October 2017. ^ Department of the Secretariat, The Universal House of Justice. "27 October 1986". bahai.org. Retrieved 1 January 2018. ^ BabAllah, Siyyid Ali Muhammad i-Shirazi. "Selections from the Writings of the Bab". bahai.org. Bahai Publishing Trust. Retrieved 2 January 2018. ^ Abdu'l-Baha, Abbas. "Some Answered Questions". bahai.org. Bahai Publishing Trust. Retrieved 16 January 2018. ^ Abdu'l-Baha, Abbas. "Selections from the Writings of 'Abdu'l-Baha". bahai.org. Bahai Publishing Trust. Retrieved 16 January 2018. ^ Also the Final Judgment, Day of Judgment, Judgment Day, Doomsday.